I’m down the rabbit hole. I’ve survived my own farce of Canterbury Tales proportions. I’m starring in a surreal director’s cut of Planes, Trains and Automobiles. And I’m running out of caffeine. Did you know the government has stopped the Travel to Interview Scheme? This is a scheme intended to help people with fares to job interviews. Well, they have. If you’re wily, however, and manage a bit of ducking and diving, it turns out they will pay your fares. Or so they say. I was told I couldn’t get help with travel expenses to interview. Then I was told I could only get coach travel across the country in search of work. Next I was told I would get train fares. Finally, I was told I was entitled to mileage. I stayed home on the settee and missed the interview. So, I did what I do, I wrote to my MP and to the Secretary of State for Work and Pensions, oh, and to the Shadow Secretary of State too. I think the reality of unemployment for skilled workers is something they should be made aware of before we all kick off and start smashing shop windows. With two degrees and over 20 years experience as a journalist and lecturer, I’m qualified and experienced enough to apply for a whole range of jobs – but jobs are few and far between. So, as Iain Duncan Smith suggested, I search for jobs outside my home city. I never expected, though, that his comment “get on the bus” was to be taken so literally. I was offered an interview in Canterbury – and I was told on calling Job Centre Plus that jobseekers are entitled only to coach travel: this meant a 21-hour round journey starting at Manchester coach station at 03.50. I would arrive after nine-and-a-half hours on National Express, with little time to get to the site, where I would be expected to give a presentation and 40 minute interview. I was then assured, however, that this was an error and I would get train travel. In fact, I was told that it would be ridiculous to expect people to only travel by coach. Job Centre Plus responded again, this time not offering coach travel or train fares but instead offering mileage totalling £133.50 and asserting, “We do not pay for overnight accommodation”. No one asked if I could drive or had a car, let alone gave me the chance to explain that I have taken my car off the road because I can no longer afford insurance, petrol and road tax. So I called the employer and told them I couldn’t attend. They were as astounded by the farce created by Job Centre Plus as I was. The reality, if we are looking work outside our home towns, is having to experience something akin to The Canterbury Tales. It would seem a 21-hour journey by coach or a 530-mile round trip by car is acceptable for those of us forced to seek work because of a global economic crisis not of our making. It costs approximately £600 per month in housing benefit, council tax and unemployment benefit for me to remain a jobseeker. Money for travel to a job interview might just have put a stop to this – and it was made clear that Job Centre Plus would have got that money back. I fail to understand how workers willing, although not keen perhaps, to leave their friends and home cities behind can do so when they can’t afford to get to the interview – or are expected to arrive looking like something the cat dragged in. Or indeed how the generosity of prospective employers could be disregarded. 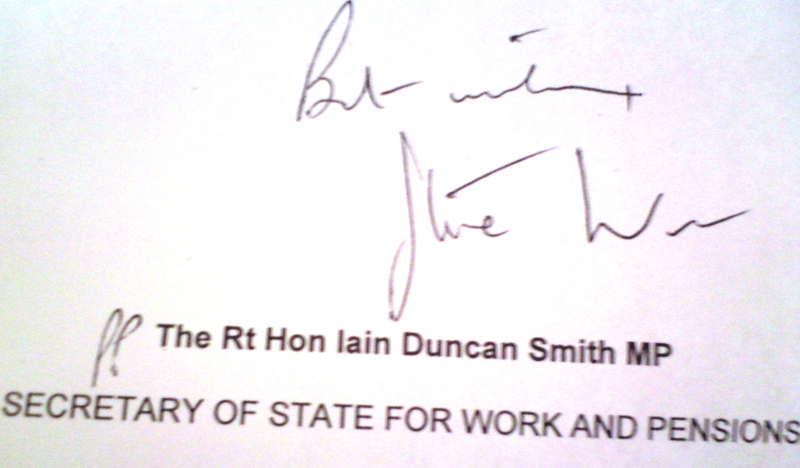 I will give IDS the benefit of the doubt and assume he has not yet seen the above letter. I will await his reply and, of course, let you know what he says. This entry was posted in Journalism, Newspapers, Unemployment by unemployedhack. Bookmark the permalink. Hang in there! I have slightly more tea bags than you do, but no more unemployment benefits!